Dwayne Johnson isn't messing around in the latest set photo from Hobbs and Shaw. Johnson has been doing his best to keep fans up to date as to what's happening with the Fast and Furious spin-off, which he is deeply proud of. Both he and co-star Jason Statham have had nothing but good things to say about the upcoming movie, noting how much of a great time they're having while making it. With that being said, Johnson looks pretty pissed in the latest photo from the set and it looks like he means business. We've seen quite a bit of pictures, both official and behind-the-scenes, from Hobbs & Shaw. Dwayne Johnson has been providing many different views into the creative process from introducing new characters to teasing the action. However, this shot is of the man himself and it doesn't look like he's in the mood for fun or anything really, except maybe for some blood. Johnson had this to say about the photo. "This sacred Samoan ground you stand on is nourished with our ancestors blood. Tonight, we nourish it with yours. Here's a lil' exclusive from set of Hobbs& Shaw our Fast and Furious spin off film coming this summer. I've been waiting for this my entire career. This is more than a movie to me - our culture & warrior mana is very real. More to come. Now they bleed." Dwayne Johnson posted the picture on his Instagram account after a lot of Fast and Furious news from Vin Diesel's social media account came down the wire today. The spin-off movie will hit theaters this summer, while Fast and Furious 9 will begin filming next month in London, according to Diesel and Michelle Rodriguez. It is still unclear if Johnson and Jason Statham will return for the upcoming sequel, but it doesn't look like it at this point in time. Dwayne Johnson recently said, "You are going to f*cking love this movie," after adding that filming "has been going great." The project has been in Hawaii to finish up and one can easily tell that it has had a profound effect on the actor. But, one can't really imagine ever having too bad of time when you get to film in Hawaii, especially since Johnson is with friends, making Hobbs & Shaw, a movie that he is already proud of. Hobbs & Shaw hits theaters on July 26th, so we should be getting some promotional material in the coming months. It's a bit too soon to start the promotional campaign, but one can be certain that Dwayne Johnson will keep us all in check when the time comes. 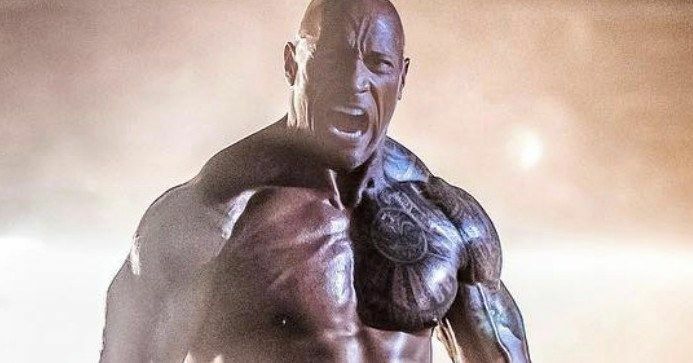 In the meantime, you can check out the ripped and angry picture of the actor from the set below, thanks to Dwayne Johnson's Instagram account.